May 2, 2013  For years, salmon farming has gotten a bad rap from marine biologists, who say the fish grown in open-ocean net pens generate pollution, disease and parasites. 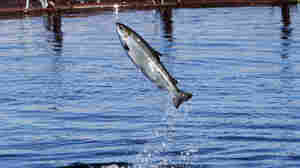 But now, a few salmon farms have moved on land. From an environmental standpoint, some scientists say, that's "a huge step forward." September 24, 2012  Muscular fish like salmon, tuna and eel can benefit from more exercise in a farmed fish environment. New research and a new book are aiming to convince fish farmers that getting fish to swim faster will mean healthier products, less waste, and more profit. May 30, 2012  One of the world's most treasured foods comes from an unlikely source — a sturgeon farm on a kibbutz in northern Israel. The prized sturgeon eggs — or osetra caviar, if you must — fetches a hefty price and has a top-chef following.